We've just released some new features and in the coming weeks we have some forthcoming developments we want to share with you. Outgoings in the past 7 days - this pane let's you see a more focused breakdown of your outgoings. It presents a graphical representation of the breakdown you regularly receive in your weekly summary. Upcoming transactions - this enables you to quickly see transactions that are imminently going to happen on your accounts. Now you'll never be caught out by an unexpected payment. At Money Dashboard, our goal is to help you get on top of your finances. 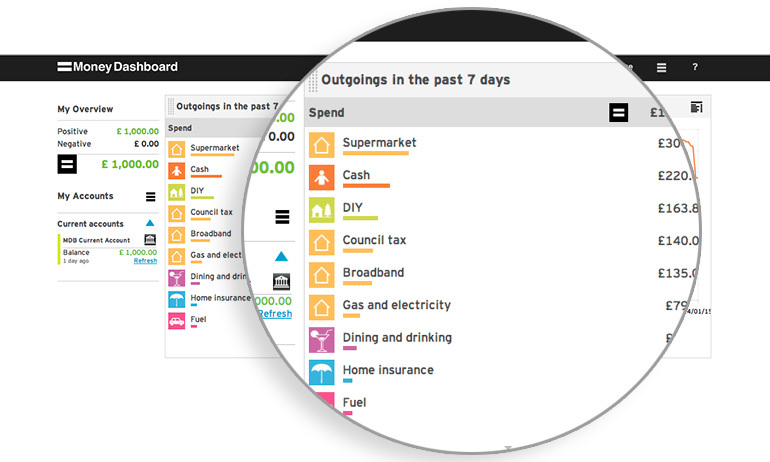 We can do this by highlighting areas where you might be overspending and suggest solutions to help you save. To achieve this we've also been partnering with a number of companies to bring you the best deals and market-leading rates across a variety of areas and products. We've already had a great response to our recent Big Energy Switch, with thousands of our users registering for a cheaper gas and electricity offer. We're also delighted to announce that the auction has taken place and the winner is one of the Big 6 energy suppliers, with a market leading tariff*. If you've participated, you'll receive your offer by the 24th October. In the next few weeks we will be releasing improvements to our past activity section.